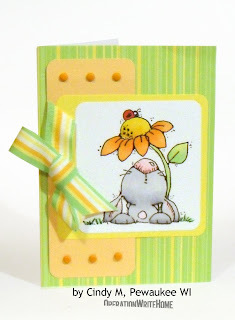 We're reinstating our featured cardmakers over here on the S&S blog....you can visit the past features here on the Homefront Blog. I have been stamping about 10 years. I have converted my son’s bedroom into my craft room. My husband made me a great craft table with lots of storage although I have outgrown that and had to buy some more shelves. Whipper Snapper Designs. They have such cute designs. I love my Copic markers. I like to paint and the markers give me a chance to do the shading I like to do when I paint. There is not a specific color. I like to work with bright cheery colors. I saw an ad in Card Maker magazine last year and thought it would be a nice gesture to make some cards for the troops. Now I’m addicted. It gives me great pleasure to give our troops a little something that may give them a smile. 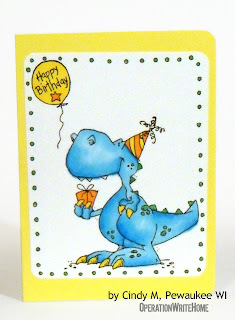 I like to make cards for kids because I’m sure that the kids get all excited to get a card from their mom or dad. I feel it’s the least I could do for the sacrifice that they and their families give to us. It also gives me a chance to make lots of cards. Wow, You are very talented in your coloring!!! Wow, what great cards. TSF. I love your style, Cindy! Your cards are great! Darling cards! You've inspired me to give kid cards another go. Your card are so cute. I really like all the different colors you use. 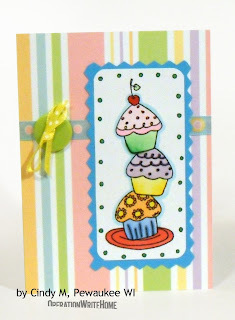 I would like to the cupcake stamp on the 2nd card for myself, do you know who makes it? It's a Whipper Snapper. They have a website, Whipper Snapper Designs, once you go in there, you'll be hooked. Great cards Cindy!! I like them all... don't think I can pick a favorite. Thanks for sharing them. Your cards are terrific, Cindy! Thanks for sharing your talent with our troops and with US!! 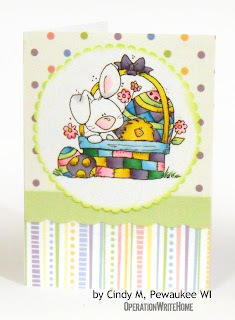 All of your cards are so cute with great colors and designs! 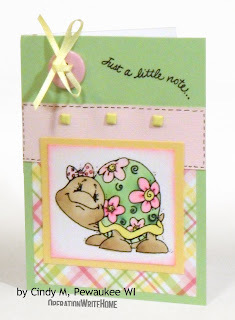 Congrats for being a featured cardmaker!! What such beautiful cards that you made. Thanks for your inspiration. All your cards are so very cute! Also, appreciate the thoughts that stand behind creating these lovely cards- 'to give kids and troops a little something to smile about'.